From conkers to singing games, rude jokes to fantasy play, this British Library website, Playtimes, brings together 100 years of children’s songs, rhymes and games. On the site you can explore war battles on bomb sites, rude jokes on council estates, and imaginary TV in the playground, to discover the fascinating world of children’s play. 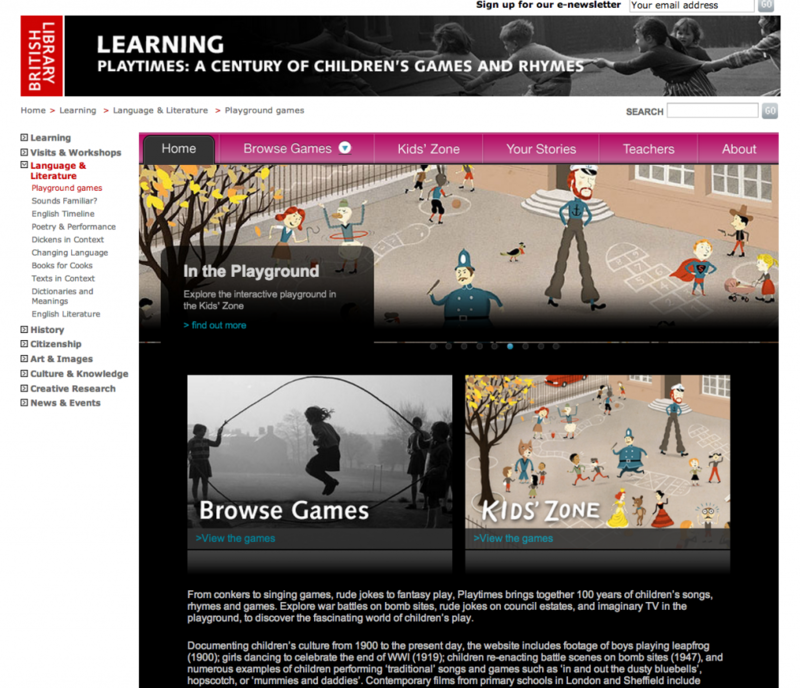 Documenting children’s culture from 1900 to the present day, the website includes footage of boys playing leapfrog (1900); girls dancing to celebrate the end of WWI (1919); children re-enacting battle scenes on bomb sites (1947), and numerous examples of children performing ‘traditional’ songs and games such as ‘in and out the dusty bluebells’, hopscotch, or ‘mummies and daddies’. Contemporary films from primary schools in London and Sheffield include children re-enacting scenes from TV game shows, computer console games and pop videos. Explore the site to discover the continuities and changes that have marked children’s play over time, and to recognise the ways in which cultural, political and environmental context influences the imagination.